Olive Ridley sea turtles crawl up onto Playa Ostional, Costa Rica by the thousands during mass nesting events called arribada, or arrival, every month. This behavior, seen at only a few beaches world-wide, has spawned a participatory conservation effort between the local village, the Costa Rican government, and the turtles. In exchange for the chance to harvest and sell approximately one percent of the eggs laid during the arribada, they keep the beach clean, guard against poachers, and protect the turtles. 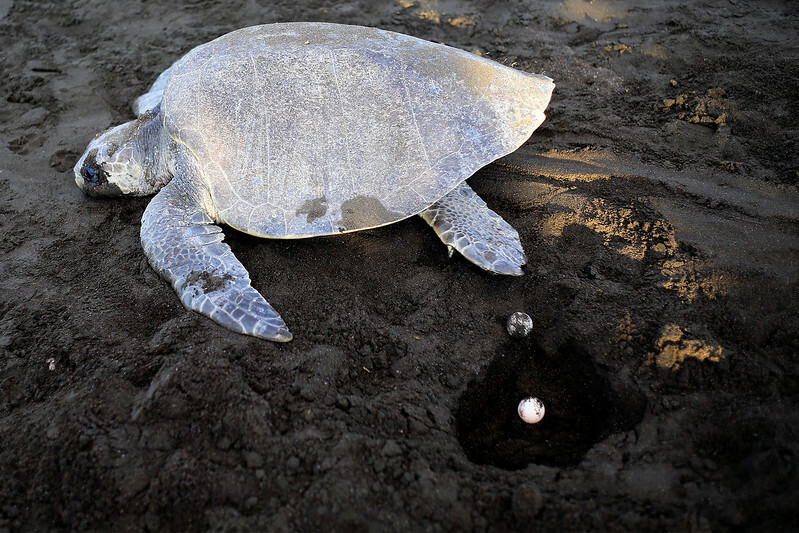 A turtle crawls past an open nest, with eggs laying inside. A turtle will lay about 100 eggs in a nest.